Hello from NC. I'm so excited to find other Sunline Camper folks. I'm wondering if anyone can suggest where to get a spare door lock key made. I have tried HD & Lowes but since it's an older camper (1996) they don't have any blanks that work. I assume you have the large square TriMark key? 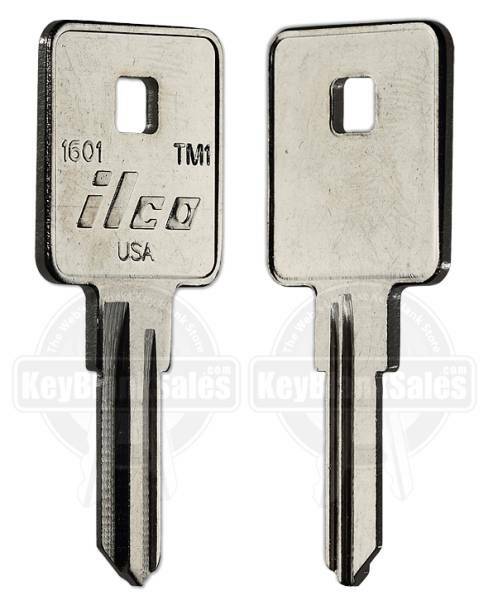 Ilco makes a blank for it with a slightly smaller head, but the key itself will work. I would try a smaller hardware store that might have a bigger selection. If that doesn't work, an RV dealer should probably carry the blanks, even though they probably can't cut them. Try a locksmith shop they should have anything you might need. I just happen to be a locksmith. Since I still haven't taken delivery of my 1982 Sunline 15.5 SB, I haven't had a chance to look at the keys I'll need to rekey the lock. Once I pick up my Sunny this Saturday, I'll check out the blanks that it uses. That's great and I really appreciate it!!! Pre-congratulations on your Sunline I'm still grinning from ear to ear since I bought mine last Friday. I'll be looking forward to the info. Hello and welcome. Congrats on your new Sunny! I have 3 keys - front door and 2 cargo doors. I was able to get them copied at Lowes. He did not have an exact match for I believe the cargo doors. He gave me the closest he had. He told me that if they did not work to bring them back. All 3 work fine. Thanks Thomascine. I'm so excited to be a Sunliner groupie She is an amazing camper!!!! Lowes was able to copy the cargo keys but not the door key. If the other key ideas don't pan out, I might see if you could take a picture of the one you had made and I can bring it to my lowes to see if they can try it. Thank you all for your rapid replies and super helpful information. I found an old-timey key making shop a few towns away. They did not have an exact match but used a Nissan double sided key blank they thought would work....IT DID!!!!! Bill, I've attached a picture of the original keys from my '86. Sunline went from a protruding knob style handle with residential style deadbolt to a recessed handle and deadbolt unit in 1991. Sunline Fan, thanks for the pics of the keys. I see that your deadbolt key is a Weiser. Mine is a Weslock, which will accept a standard Kwikset blank. Once I find a Kwikset knob, I'll rekey both to match. Yep. I can't say for sure if that was original or not, but I do remember both were keyed alike. The one on the right is the key for the fresh water fill, and people have struggled to find that one over the years. It's a really flimsy key, just stamped metal it appears, but it's what opens that.